A recreational day camp for children entering 2nd to 6th grades. We offer fun recreational, sport, and lifetime activities throughout nine sessions. Our goal is to provide a supportive and enjoyable environment where learning and fun can go hand in hand. Specific sport instruction is not a goal of the camp. Special attention is paid to the age and skill level of each camper. CHILDREN ENTERING 2ND TO 6TH GRADE ARE ELIGIBLE FOR ENROLLMENT. A day camp is designed for youth in middle school to have the opportunity to participate in recreational, instruction, and lifetime sport and leisure activities. A variety of activities will be available for the youth to participate during each session. ENROLLMENT IS OPEN TO YOUTH ENTERING 7TH AND 8TH GRADES. Your child's day will begin and end at the state-of-the-art Campus Recreation Center on the campus of the University of Nebraska-Lincoln, which provides 280,000 square feet of recreation and sports space. Activities will take place at various indoor and outdoor locations on campus, as well as in the Lincoln community. Regularly scheduled swimming will be held at the Mabel Lee Hall indoor heated pool. Camp sessions are scheduled Monday through Friday with structured activities from 8:45 a.m. to 3:55 p.m. Camper drop-off is scheduled between 7:15 - 8:40 a.m. and pick-up between 3:55 - 4:15 p.m. Supervised curb side drop-off ends at 8:40 a.m. If a camper arrives later than 8:40 a.m. s/he must check-in with the summer camps main office and be escorted to camp by a staff member. An optional Extended Day Program is available at a nominal rate for those campers who wish to remain late. Supervision and low energy activities are provided from 4:15 - 5:35 p.m. Additional fees apply for the extended program. You may sign up for the extended program with regular session registration. Our energetic and well-qualified staff are ready to spend an exciting summer with the campers. The staff is comprised of UNL professionals, certified school teachers, and highly motivated college students. The camp is under the direction of Brian Stelzer, who is a professional staff member at UNL Campus Recreation. A variety of recreational sports and leisure activities are offered each session. The camp activities are very similar to those found in a physical education class. Campers are assigned to groups according to their grade level. We encourage participation in all activities and spend the majority of time outdoors. Swimming - We offer swimming on multiple days for Husker Kids campers. Field Trips - A field trip for each camp will be planned for every session. Theme Days - Campers will participate in one special event activity each session. Crafts - Each session will include a make and take age-appropriate craft. Husker Adventures will focus on exposing young men and women to a variety of activities stimulating the mind and body. Instruction in the basic skills of traditional and non-traditional sports will occur during all sessions. Opportunities will be presented for campers to interact with University of Nebraska faculty and staff in educational and exciting projects. A challenging and rewarding experience awaits. 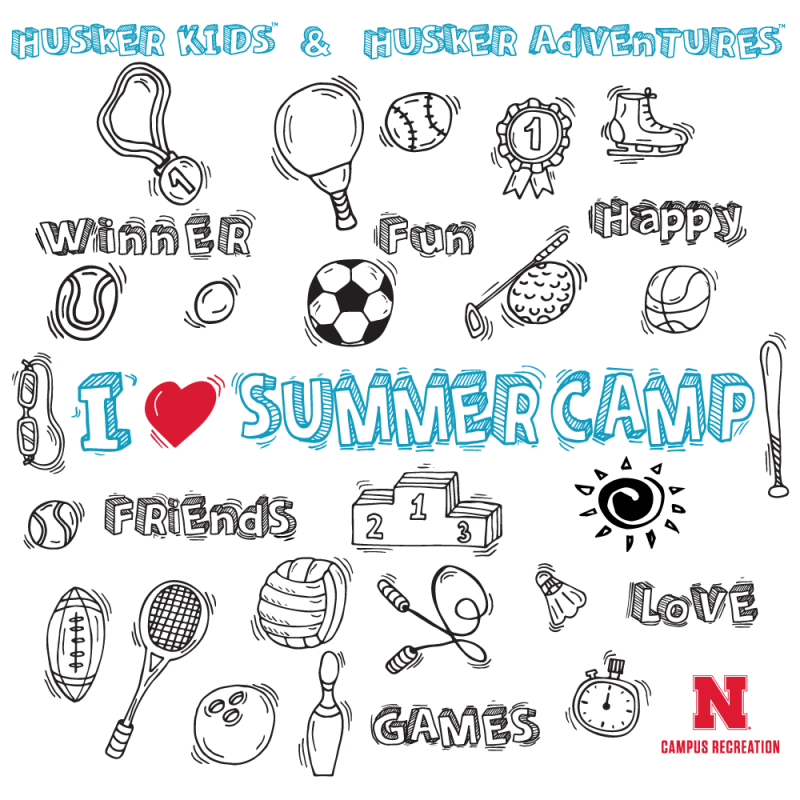 Swimming - We offer swimming on multiple days for Husker Adventures campers. A snack such as chewy granola bars, pretzels, or fruit chews and a juice box will be provided mid-morning. Campers will also receive a small afternoon treat. Parents are reminded to send a lunch and drink with the camper. Please do not send candy or gum. Participants should come to camp dressed for a full day of activity. We recommend outdoor activity clothes and athletic shoes. Open-toed shoes will NOT be permitted. For Husker Kids, please pack a swimsuit and towel everyday. Husker Adventures swimming apparel needs will be outlined in the session newsletter. Campers should bring aforementioned items in a well-marked backpack or athletic bag. Campus Recreation is not responsible for missing, broken, or stolen items. Please mark or label all personal items. Every reasonable effort is made to ensure property protection. Campus Recreation reserves the right to dismiss a camper if their behavior jeopardizes the other campers' safety and well-being. Guardian's Waiver and Release of Liability, and Check-out Authorization forms are required to participate in camp. Parents must also complete a supplemental information form before their child may begin camp. Campus Recreation reserves the right to cancel any session or modify activities due to under-enrollment, facility problems, staff concerns, or circumstances beyond its control (i.e. rain, pool problems, electrical outages). Parents will be notified immediately if a session is altered in any way. If a participant must cancel a session, the session deposit will be forfeited. All cancellations must be made in writing at least one full week prior to the session to receive a refund.